This tutorial is the demonstration of how to consume the web service from salesforce. In this example, we are going to consume the enterprise WSDL of the Salesforce in C# application. Log into the Salesforce and navigate to “Your Name | Setup | App Setup | Develop | API” and select the “Generate Enterprise WSDL”. Copy the URL, as we will need this in our C# Application. Right click on the “References“ folder and select “Add Service Reference“. 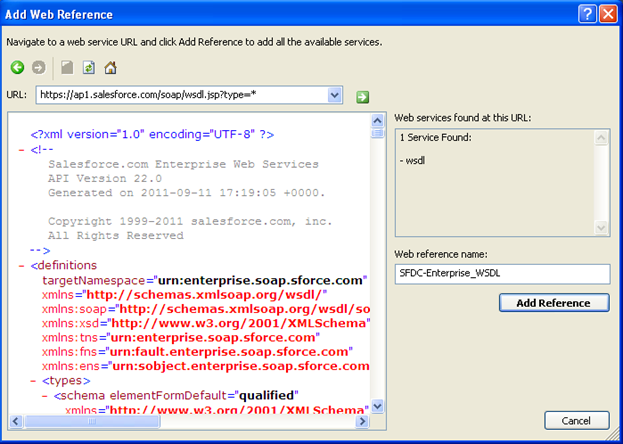 Provide the URL of the generated WSDL, which we have discussed above in this tutorial. It will prompt you for the username and password of salesforce, so provide it. After validation, it will display you below screen. Provide ” the web reference name” which will be used in program. In this case, the web reference name is “SFDC_Enterprise_WSDL“. After Successful login, set the “SessionHeaderValue” and “SessionHeaderValue.sessionId”, In this program, we are displaying the comma separated name of all the available objects available to logged in user. You can download the source code in next tutorial. In Next tutorial we will discuss on creating the custom web service in salesforce and consuming it in .Net application using c#. I want to create a common web service which access any salesforce server wsdl on runtime and access its custom objects to perform operation. You can try this example. Give the username and password of any organization and try. When I pass username and password or any organization. it connect but i can’t access wsdl of that organization to access its custom objects because every organization have its custom objects. Basically i want to add web reference of wsdl on run time. I have not tried this and i think it would not be straight forward. You can easily bind webservices – WSDL dynamically in c#, However to get the web reference of salesforce enterprise wsdl, we have to supply the credentials of the organizations. I will try to find out the solution, in mean while if you get the answer please post here so that others can get benefited. Instead of Enterprise WSDL, use the Partner WSDL. It would work in this scenario. I have to use BULK API functionality of Salesforce in C#. Just want to know first which WSDL should I use Enterprise one or the Partner one? I have downloaded Salesforce.com Partner Web Services API Version 24.0 but it seems it doesn’t have those required parameters what I am looking for. Partner WSDL is very generic, give a try to Enterprise WSDL however it is tightly coupled and have its own disadvantages. This is talking about inserting data into salesforce. Do you have an example to push data from salesforce (to Biztalk)? I need to push data out for each Case insert/update. Hello guys I have to consumes partner wsdl in Asp.net application. Can you help me …!! I am new in webservice.Please guide me on same.I want to create webservice in apex.And I want to the depth od the webservices.